Morizono used to always say, "Go where the customers are." But there were times when the customers came to Sony. On one such occasion; a second line of BV series (U-matic) equipment was under development. Takano and a few other engineers went to the NAB (National Association of Broadcasters) Show in Las Vegas. During the show, an engineer from NBC (National Broadcasting Company, Inc.) came to Sony's booth and invited Takano back to his hotel suite. One room of the suite was full of heavy equipment, which was set up as an editing room for the benefit of the Sony people. He said, "I want you to see what we're going through when we produce on-site reports. We want you to develop something that will solve the problems we currently have." Then, he did a demonstration of the editing process using the machines he had placed on the bed. For a broadcast station, the equipment used is of vital importance for its day to day operations, explaining why broadcasters are eager to provide feedback to manufacturers when they need improvements made. Immediately upon returning to Japan, Takano incorporated the information he received from the NBC engineers into the products already under development. Sony's engineers were constantly learning then. The information acquired through communication with customers became an important part of Sony's broadcast equipment business. The first lesson Morizono and his team learned was that broadcast stations never stop working. If a defective tape or any other cause hinders the beginning of a broadcast even for a few seconds, the station loses money. Morizono and his team were pressed to raise the reliability of their products to near perfection. Morizono also established bases for Sony's broadcast equipment business in Europe, the United States as well as Japan. As broadcasting standards differed in each region, sales and technical support had to be customized. When the European base was being planned, Morizono decided that he wanted to have someone well acquainted with local broadcast stations, knowledgeable of the relevant technology and possessing business acumen to spearhead the business. Therefore, when Morizono met Howard Steele, former technology chief of the U.K.-based IBA (Independent Broadcasting Authority) and ex-chief of the EBU (European Broadcasting Union), Morizono asked Steele if he could recommend someone. Steele took a moment to think and said, " Okay, I think I know someone. He'll probably be at the broadcast equipment show in Montreux, Switzerland, so I'll introduce him to you then." Steele was an outgoing man with a good reputation, so Morizono thought that anyone Steele recommended must be good. He was looking forward to meeting the candidate. During the Montreux Show, Morizono received a phone call at his hotel from Steele. He was ready to introduce the candidate to Morizono. When Morizono went to the restaurant where they were supposed to meet, Steele was sitting alone, already quite inebriated. Morizono had a reputation for being a heavy drinker, but he was no match for Steele. When Morizono asked where the candidate was, Steele smiled broadly and replied, "I'm right here." Steele was famous for his sense of humor, but this truly surprised Morizono. In 1978, Steele joined Sony and Sony Broadcast Ltd. (SBC) was established. Thanks to Steele's leadership and the hard work of his team, Sony's European broadcast business expanded rapidly. In the United States, Tsunoda was told by Morizono that Sony must fulfill a key requirement of manufacturers selling to broadcast stations--establishing a 24-hour service system. In response, all of Sony's service engineers were given pagers and their cars were equipped with tools. If there was a machine in need of repair, Sony made it a rule that the problem would be fixed by morning, even if it required working all night. When the service teams first visited customers and introduced themselves, the broadcast stations did not take them seriously saying, "We are professionals. We cannot entrust our operations to a consumer products manufacturer." However, after about six months, Sony began building a solid reputation among the broadcasting community for the quality of its service. "If you call Sony, they'll fix anything in half a day or one day at the most. No company has ever done this before. Sony really cares about their customers," was the reaction in the broadcast community. Sony took note of this success and introduced a 24-hour service system in Europe right from the start. Morizono strictly forbade his salesmen to sell in areas where service was not available. Salespeople generally do what they can to get a customer to make a purchase, but Morizono stood by his strong belief that selling is not everything. "If a customer buys our product and it breaks, service has to be provided. If we can't provide adequate service, the customer will never buy Sony products again. We'll lose their trust," said Morizono. Sony's broadcast business remains successful thanks to the establishment of business operations in Europe, the United States and Japan that meet the customer's every need--an approach that has enabled the development of a sound relationship based on mutual trust. The local business bases eventually expanded from sales and service functions to include design and development of equipment customized to the needs of customers. As the ENG system using U-matic became standard for broadcast stations, on-site reporting became less and less laborious. 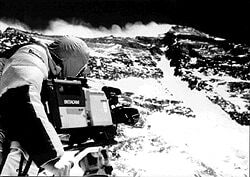 However, at this time a mobile system consisted of a VTR operator and a sound crew standing behind a cameraman. A group of four or five people was still needed to operate one system. Furthermore, if the cable connecting the camera to the VTR was forgotten, the system was useless. Moreover, the connecting cable often restricted movement. Eventually, broadcast stations began asking for a simpler, lighter system that required fewer people to operate. At that time, while Takano was working to improve the image quality of the BV series, another section within Sony was developing an industrial-use camera and VTR unit that used a similar sized cassette tape as Betamax. These two efforts were combined and a new ENG format was developed. This was based on a single unit camera and VTR, employing the same size cassette tape as Betamax. In April 1981, Sony displayed the BVW-1 Betacam unit at the NAB Show. In the meantime, Matsushita launched the M Format, and once again a competition loomed as to which format would dominate the market. Sales of home-use Betamax weakened in stark contrast to the surging sales of the Betacam VTR. Eventually, Betacam became the de facto standard for ENG, capturing 95% of the market. The foundation for this impressive outcome was the trust gained by Sony through its marketing efforts of U-matic in the early 1970s. As Betacam became popular, users began to demand a Betacam VTR with editing capabilities. In 1983, this was realized with the introduction of the BVW-40 model. Sony now offered a full line-up of Betacam equipment from acquisition through post-production. The underlying concept behind Sony's broadcast equipment business was "Customers come first." All product development was undertaken with the convenience of the user in mind. Eventually, Matsushita tried to reduce Sony's market share by introducing the M-II Format, a successor to the M Format. M-II utilized a metal tape for recording high quality images. Sony responded by introducing Betacam SP (Super Performance), its own line of hardware, which used metal tape. The BVW-505, introduced in 1986, was the first Betacam SP machine. This was widely accepted by users as it not only improved image quality, but also was compatible with conventional Betacam, thus generating growth of the standard throughout the industry. As often is the case, competition leads to technological improvements. The mobility and functions of Sony's ENG equipment improved drastically thanks to the competition from Matsushita's M and M-II formats. VTR at NAB in March 1979. "Can the VTR be digitized?" This was the question of many video engineers in 1976. At the time, the demand of commercial film producers was for a VTR that did not lose image quality when subjected to numerous dubbings. Digital images theoretically do not lose any quality regardless of the number of dubbings made. Digitized images would require a far wider frequency band than digitized sound, which was about to be realized by Sony. Most people did not think this was feasible. 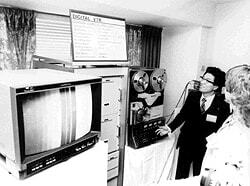 Under these circumstances, Yoshitaka Hashimoto and his group began fundamental research of digital VTRs in March 1977 at the Research Center in Yokohama. 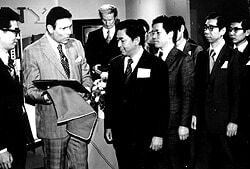 The actual project was launched in March 1978, a year after Hashimoto's team started their research with Morizono's blessing. Steele who was leading SBC into a successful business expansion in Europe motivated Morizono. He persuaded Morizono by insisting that the future was in digital broadcasting. Takeo Eguchi, who had studied digital VTR technology at the Massachusetts Institute of Technology (MIT) returned to Japan and joined the development team. The project evolved into a major effort with R&D facilities in both Europe and the United Sates also assisting. Everyone involved spent days and nights thinking only of digital technology. The Japan based engineers went to the Sendai plant and had the engineers upgrade the quality of tapes and recording heads, preaching to them about the coming digital age. In just a year and a half, a digital image was played back on a VTR. At NAB in 1979, Ampex, Sony and Bosch G.m.b.H. independently introduced the fruits of their digital research, opening the door to serve competition for digital VTRs. Eventually, in consideration of the benefits to users as well as to manufacturers, a movement to establish a universal standard emerged. There are three major broadcasting systems in the world: NTSC for Japan and the United States, PAL for most of Europe and SECAM for countries in the Middle East. The standardization effort was an attempt to cover all three systems. At the time, the standardization of the digital VTR was the hottest topic with SMPTE, where standards were decided. A team of Sony engineers visited the United States several times, and they participated in talks with their counterparts from all over the world, even though Japanese engineers were rarely seen then at SMPTE. Each broadcast station and manufacturer would send teams of twenty to thirty engineers at a time, eagerly setting forth their technology. In a similar way, Eguchi and his team explained their position and worked to persuade their counterparts. Eguchi had been a member of SMPTE since his days at MIT and once he was selected for the digital VTR task force at SMPTE, he began to play a major role within the organization. Eventually, negotiations with European representatives were completed, and a universal sampling frequency of 13.5MHz was agreed upon. Eguchi learned a very important lesson through this standardization process, which will not succeed if one insists on a Japanese perspective. Learning to understand the perspective of people from all over the world with different cultural backgrounds is international communication in its truest sense. Once an international standard was established, product development proceeded. In 1987, Sony introduced the world's first component digital VTR, the DVR-1000 (D-1), and in 1988, a composite digital VTR, the DVR-10 (D-2) was introduced. The D-1, capable of individually recording luminance and color difference signals, had a very high resolution and was endorsed by broadcast stations and video production houses alike. The D-2, which records an integrated signal, was widely used as the digital VTR for production and transmission at stations, replacing the conventional composite analog one-inch VTR. The digitization of images, close on the heels of digitization of sound, marked the beginning of a new era in broadcasting systems. The digitization of the VTR proceeded rapidly, driven by demand for higher quality images. Meanwhile, Sony's broadcast equipment business with its basic philosophy of thoroughly satisfying the customer expanded from unit items to total systems under the leadership of Kiyoshi Yamakawa. The annual NAB Show in the United States provides a good indication of the state of the world's broadcasting business. In 1989, the Sony booth had the theme of "System Solutions" and the 1990 theme was "The Digital Age." Sony was leading the world in digital technology and was providing total systems to meet customers' needs. Sony's digital editing equipment, such as switchers, multi-effects units and VTRs enabled users to increase their image processing capabilities. In 1979, Sony developed the Library Management System (LMS); a cassette-based, fully automatic system for commercials and program playout at broadcast stations. This marked the beginning of station operations automation. In the early 1990s, other manufactures began introducing practical applications for digital systems, thus opening the market to competition. Eventually, the movement toward digitization expanded from the broadcast station to on-site broadcast application. In March 1993 Sony successfully launched Digital Betacam, a 1/2-inch component digital VTR. The Digital Betacam VTR utilized compression technology, which until then had been ill-thought of by broadcast stations, and delivered high quality, component digital recording with a low cost camera the same size as the Betacam camcorder. Digital Betacam was compatible with the widely used analog Betacam format, enabling users to gradually progress to the next-generation digital system. This was a very important feature for users. Broadcast stations were interested in a digital VTR system that was drastically lower in price than the D-1 and capable of producing high quality component images. Toshio Fujiwara and Kozo Kaminaga's R&D team developed the relevant video compression technology, and product development was given to Akio Takeuchi and his group. Component digital recording uses many cables for the transfer of audio and video signals. The Serial Digital Interface (SDI), which was commercialized in 1989, significantly simplified the system by allowing the transfer of these signals through just one coaxial cable. Sony received many orders worldwide for broadcasting systems fully utilizing SDI and Digital Betacam. These included systems for use at the International Broadcasting Center in the Lillehammer Winter Olympics in 1994 and from Hughes DirecTV in the United States. The company's reputation and brand image in the broadcast industry continued to improve. Computerization was also incorporated into digital systems. Integrating computers into the system enhances the automation of operations at broadcasting stations, raising their efficiency. As broadcasting systems become more sophisticated and require labor-intensive maintenance and management, increasing staff is not always cost-effective. Interactive Status Reporting (ISR) was developed with the idea of incorporating a self-diagnostic function in the system through the use of a computer. 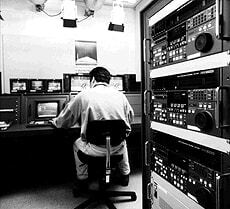 ISR enables a small number of people to comprehensively and effectively monitor the equipment used in broadcasting stations. ISR was first commercialized and launched in 1994. Sony's lineup of broadcast video equipment developed over the past twenty years has won many Technical Emmy Awards. Since its first Emmy for the development of the Trinitron color television in 1973, Sony has received awards for the U-matic, one-inch (type C), Betacam, D-1 and D-2 VTR. In 1995, Sony won its twentieth Emmy Award for Digital Betacam. Sony staff presently responsible for the development, production, and sales of broadcast equipment continue to work in line with Sony's basic principle of "meeting individual needs of users and providing total system solutions for a digitized, automated, and efficient broadcasting system."